Picture quality off the intensity chart. The LC-70EQ10U is an LED Smart TV that features Sharp's proprietary Quattron color technology for finer details and a billion more shades of color, so images explode with vibrant detail and brighter yellows, deeper blues, and richer golds. The LC-70EQ10U also features an 8 million: 1 dynamic contrast ratio and a 240Hz refresh rate for advanced clarity during fast-motion scenes. 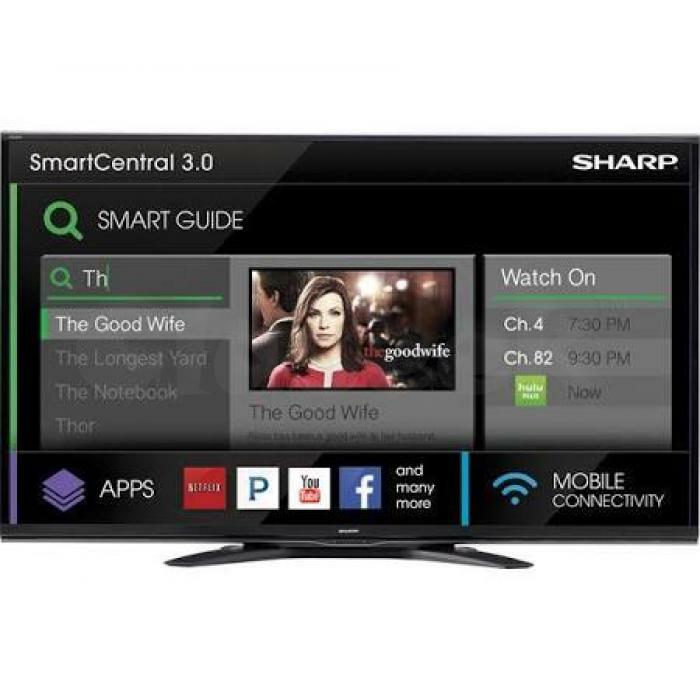 This TV features the SmartCentral 3.0 smart TV platform, which allows you to search less and discover more. A smart guide integrates cable, satellite and streaming channels - no more switching TV inputs or apps to find the shows you want to watch. SmartCentral also gives you access to the best apps, from instant access to movies with Netflix and Vudu, to videos with YouTube, music with Pandora and Rhapsody, social with Facebook, and the best of gaming. Now, virtually everything you do on the TV can be done from your tablet or smartphone. The SmartCentral 3.0 mobile app lets you search and discover new content without interrupting what you're watching, and launch it seamlessly. Change channels, volume, or inputs and adjust picture settings. Share videos, pictures and music. And with Miracast screen mirroring technology, anything on your smartphone, tablet or laptop can be viewed in glorious high definition TV without a wired connection.